I suffer from DWB these days—Driving While Botanizing. How many of you can relate? I am positive it is endemic amongst plant lovers. The things that catch my eye this time of year are most definitely the early blooming trees. Most of these bloom in shades of white and pink, but there is one that stands out from the crowd: the eastern redbud. And this week in particular seems to be peak season in the lower Hudson Valley. A subtle but stunning tree, the redbud, or Cercis canadensis, will not reach great heights. An understory tree, its purple-pink flowers make it a statement in the landscape, and it has been wholeheartedly embraced by the nursery and horticulture industry for its ornamental umph. Its short stature makes it an excellent street tree and you will easily spot it this time of year in many plantings alongside public roadways. 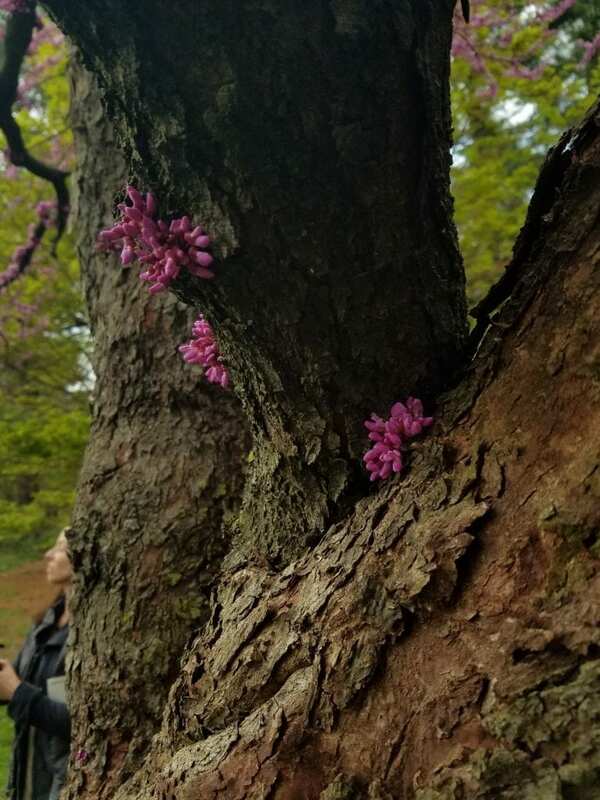 While there is a non-native redbud, Cercis chinensis, it is very easy to distinguish from the indigenous variety; Cercis canadensis is a tree, and has a single trunk, while Cercis chinensis is a shrub and has multiple branching stems. The Lady Bird Johnson Wildflower Center states that there are three varieties of Cercis canadensis: Cercis canadensis var. canadensis, Cercis canadensis var. texensis and Cercis canadensis var. Mexicana—something I was unaware of until doing my research. The latter is found in Mexico and parts of western Texas; C. canadensis var. texensis is indigenous to the geographic region found between Texas, south of Oklahoma, and northern Mexico; and the variety canadensis is indigenous to our region, though its range extends all the way down to Texas as well. Cercis canadensis in flower. Taken at the New York Botanical Garden. It is a member of the Fabaceae (Pea) family, which is made abundantly clear by looking at the flowers, which resemble many of those in its family. Up close, Cercis canadensis’ flowers can look like alien growths growing on tree bark. The flowers can form directly off of the bark, not off any long stems or branches, thus giving it this “fungal, growth-like” appearance. In the summer, it produces beautiful, waxy heart-shaped leaves. Besides its seasonal interest, Cercis canadensis is a great plant for both sunlight and shade, proving itself adaptable to both light conditions. 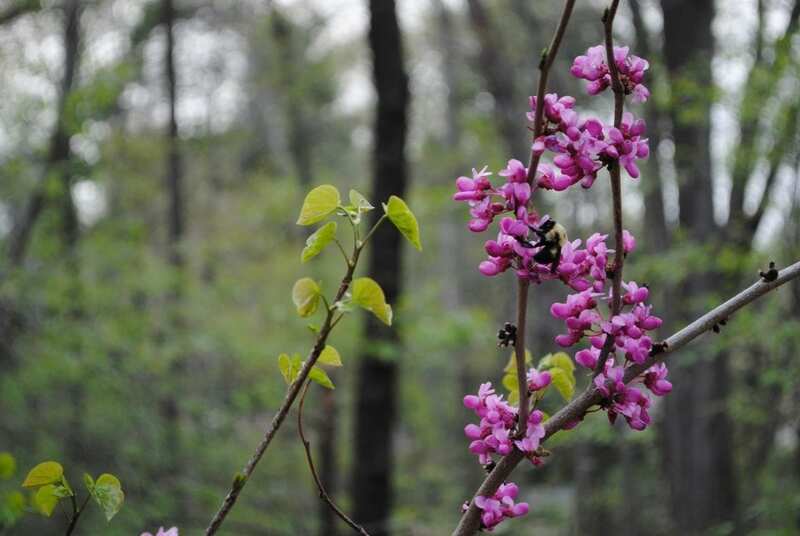 Cercis canadensis in a shaded woodland, with a pollinator friend. Additionally, Cercis canadensis is a fantastic pollinator. Typically blooming from March until May, Cercis canadensis is one of those important early pollinator plants. According to the Xerces Society, it holds particular value to native long-tongued bees who are attracted to its nectar and pollen. The tree also plays host to butterfly caterpillars and other insect larvae who munch on its leaves. A fantastic substitute for non-native cherry trees—for which it is often mistaken—Cercis canadensis is truly an impressive tree in the landscape, a real show-stopper in the early spring in any garden. But more importantly, it provides an important ecological service for our pollinators.